For quite a while it has been agreed by experts that a properly working aeroponic system is pretty much the most effective way of growing plants without soil. The way an aeroponic system works is by supplying the root zone of the plants with a fine mist of liquid nutrients rather than just a continuous flow of liquid, this not only fulfills the plants nutrients needs but also gives the plant a large amount of oxygen within the nutrients which is an ideal situation to be in. The fine mist in a small system can be supplied by a spinning nozzle which is simply attached to a standard hydroponic nutrient pump outlet within a nutrient container. The plants are then suspended in baskets or just loose above the mist so that the roots dangle into the nutrient spray. One of the good things about a small system like this is that you can easily see all the fast root growth as it happens by carefully lifting the plants out of the nutrient mist. The biggest problem with an aeroponic system is the upkeep necessary to keep the fine mist system working correctly. For example blocked nozzles will instantly stop the system from working correctly and starve the plants of the necessary oxygen and nutrients they need. 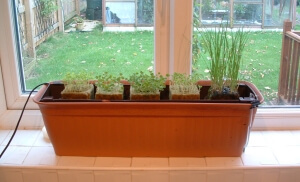 Aeroponic systems are currently in the early days of development and I’m not sure at the moment whether these systems will prove reliable enough for continuous use, but I am going to give one a go this year (2006) by trialling an aeroponic propagator I have purchased. Early results are very very encouraging, please keep visiting my 2006 web pages for photos. Also if you would like to see a large scale aeroponic system in action you might like to take a trip to Epcot at Walt Disney World in Florida, In the Land area of the park you can see a large scale system in action for yourself which supplies food to all the Hotels and Restaurants around the Walt Disney resort. If your not planning a visit soon though have a look at my Our and About section where you can find some photo’s I have taken from a previous visit there, There are also photo’s of the other systems they have there such as NFT systems etc. 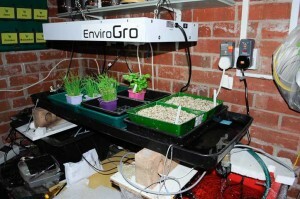 This entry was posted in Hydroponics, Methods and tagged aeroponic, fruit, greenhouse, growing, hydroponics, methods, plants, seeds, vegetables by Paul_E. Bookmark the permalink. This is my first time to read articles/links about aeroponic farming. That diagram alone illustrated above (the moving one) simply says it all. The link below also provides more information about aeroponic system.